It gets old. Life, that is. Friends move away, travels end, interests stop being interesting. It's what happens to Richard Hannay: he loses his zest for life. 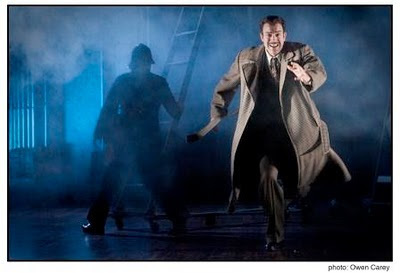 Richard Hannay (Leif Norby) is our ordinary-guy hero in Portland Center Stage's The 39 Steps. That is, he starts out ordinary, and bored, until he encounters a mysterious woman who falls dead across his lap, knifed by an unknown killer. So begins his flight from those trying to pin murder on him. And so begins his life. And while Richard Hannay's character is suddenly surrounded by intrigue, pointed guns, police chases and disguises, the audience comes to life, too, just by laughing. Because it's funny. This version of Alfred Hitchcock's 39 Steps makes great fun of a bygone era of filmmaking, with references to Hitchcock classics. It also makes fun of itself - giving us the illusion of a creaky old theatre (complete with squeaky red velvet curtains) with a low budget set. It's a spoof, a hoot and a holler. Once you start laughing, there's nary a chance to catch your breath. Along with Leif Norby, the performances of Darius Pierce, Christine Calfas, and Ebbe Roe Smith showcase comedic acting at its best. Each scene showers you with giggle-worthy surprises: doors and windows that won't stay put, ticking clocks and train ride chases, shadow puppetry, a Scottish zealot (ever wary of wackedness) and an aged, benign politician who doesn't realize we can't hear a word he's saying. In the midst of all the laughter, there's truth, too. A life without challenge doesn't bring out much in a person. Only when life makes demands, do you find out what you're made of, discovering the adventure life can be. As Hannay puts it, "You carry on. It's pretty bracing if you do. Something stirs the old bones, gets the ticker beating." Has adversity ever brought more "life" into your life? How?